Home Hawaiian Airlines is this year’s ARTafterDARK partner! Hawaiian Airlines is this year’s ARTafterDARK partner! 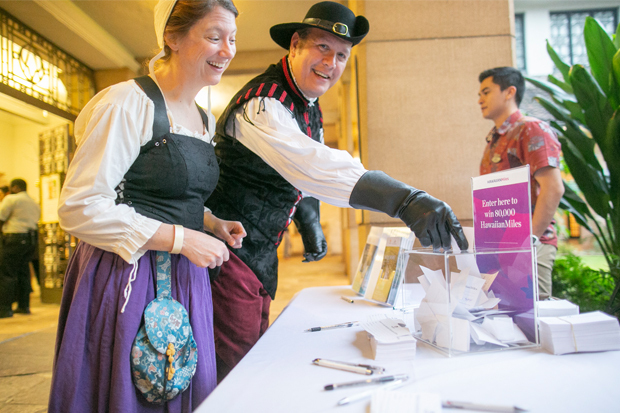 In January and February of this year, ARTafterDARK attendees were delighted to find a Hawaiian Airlines table stationed at the entrance of the museum hosting a HawaiianMiles giveaway. The Hawaiian Airlines team have become familiar faces at the event, as HoMA and Hawaiian Airlines recently announced an exciting new partnership: Hawaiian Airlines will sponsor exhibitions throughout 2019 featuring artists from the carrier’s 10 international or 12 domestic destinations, beginning with the Lisa Reihana: Emissaries exhibition. Hawaiian Airlines® Bank of Hawaii World Elite Mastercard® is also the Presenting Sponsor of ARTafterDARK in 2019, the museum’s monthly evening art party dedicated to promoting a vibrant local arts scene. “We’re proud to elevate our partnership with the Honolulu Museum of Art as we expand our support of the arts in Hawai‘i by investing in exhibitions that feature local and global artists,” said Avi Mannis, senior vice president of marketing at Hawaiian Airlines, “and we’re happy to bring our Hawaiian Airlines Mastercard cardmembers closer to the things they love by offering them special access to Hawaii’s premier events.” Hawaiian Airlines is the museum’s highest-level corporate donor. 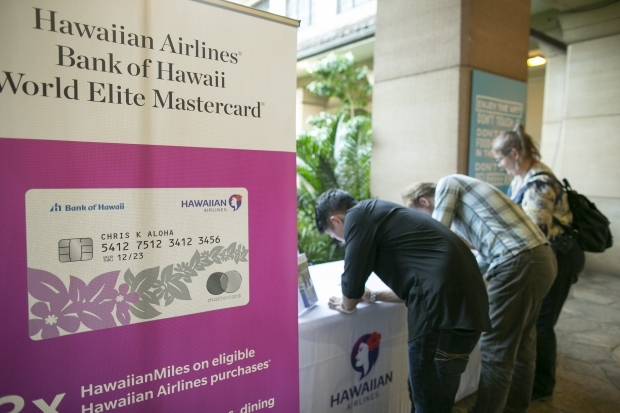 As Presenting Sponsor of ARTafterDARK, Hawaiian Airlines® Bank of Hawaii World Elite Mastercard® will have a presence at each event, hosting monthly HawaiianMiles giveaways open to all attendees. Cardmembers will receive a free guest pass to ARTafterDARK (a $30 value) when using their co-branded credit card to purchase or renew an annual HoMA membership. The Hawaiian Airlines® Bank of Hawaii World Elite Mastercard® team will host branded activations at selected ARTafterDARK events this year. Now in its 15th year, ARTafterDARK attendees can expect a renewed focus on engagement with exhibitions, artwork from HoMA’s collection, and musical and dance performances by local artists. January’s event celebrated HoMA’s Renaissance gallery with a Midwinter Night’s Dream theme, and February’s event tied in to to Doris Duke Theatre’s African-American Film Festival with a The Art of Hip Hop. This month, on March 29, ARTafterDARK celebrates current museum exhibitions by female artists with Grrl Power. HoMA is grateful for the ongoing partnership with Hawaiian Airlines. Their 2019 Visionary and Presenting Sponsorships provide incredible support for the museum’s outreach to thousands of art-lovers. Entering to win Hawaiian Miles at ARTafterDARK: A Midwinter Night’s Dream. Hawaiian is a wonderful airline that truly lives up to the spirit of aloha. Their flight staff is so attentive and considerate, their plans are quiet and comfortable, and their inflight service excellent. Not to mention, their on-time record is outstanding. We always fly Hawaiian to and from the Islands. So pleased to see their support for the arts as part of their corporate mission!